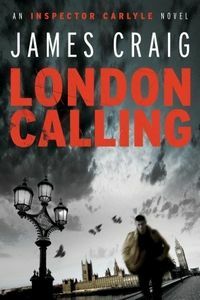 London Calling by James Craig, a Mysterious Review. Review: Detective Inspector John Carlyle walks a fine line when he investigates the murder of several men, who also to have a connection to the country's political elite in London Calling, the first mystery in this series by James Craig. Initially at a loss to explain the link between the men, who have each been murdered in a most particular manner, Carlyle does the obvious: enter their names in a search engine. They all have ties to early- to mid-1980s Cambridge, and more specifically, "The Merrion Club: Young, Rich, and Drunk". Further research reveals that "it wasn't considered a proper night out until a restaurant had been trashed. A night in the cells was part for the course for a Merrion man. So, too, was the debagging of anyone who incurred the irritation of the Club." But in order to learn a motive for the crimes, Carlyle must question other members of the Club, who were there at the same time as the murdered men. And several of those members are on the cusp of taking over leadership of the country, including the presumed next Prime Minister, none of whom seem particularly interested in revisiting the past. London Calling is an unusual sort of modern crime novel. It's not a procedural or a whodunit; in a series of flashbacks it's revealed that a man committed suicide after a round of "debagging" by the Club, and it's pretty obvious early on to the reader, if not Carlyle, who the killer is. Indeed, the investigative plotline is actually fairly thin. Rather the narrative often takes on a literary quality, with long, elegantly written paragraphs that are stylish but contribute little in the way of advancing the plot. There are also conversations between two people often lasting 20 pages or more. Lengthy, to be sure, but also surprisingly interesting and well-written, providing unexpected insights into the characters. And in a twist that isn't a twist, everything is not neatly wrapped up in a pretty package at the end. From a character perspective, John Carlyle is refreshingly normal. His family life is normal, he has a normal relationship with his colleagues, and he seems to take a balanced and reasoned approach to his job (i.e. not doing the dumb things smart people do in so many other mysteries). While it doesn't take any significant risks in plot or character development, London Calling is on balance a departure from what seems to pass as popular crime fiction these days, and a welcome one at that. Acknowledgment: Soho Press provided an ARC of London Calling for this review.